After having been hidden for more than half a century behind the mask of an assigned name, the true (catalog) name for Hawkes’s patent no. 18,267 is now known, thanks to the publication of a [HAWKES PHOTOGRAPHIC FOLIO (c1897)] in 2003 (note 1). This pattern’s mask was the assigned name, “Old-Fashioned Hobnail.” Although Dorothy Daniel gave the pattern this name in 1950, not all reseachers have gone along with her suggestion. The Pearsons, for example, avoided it. They, in fact, gave the pattern no name at all (Pearson and Pearson 1965, p. 47)! Others, from Revi to Spillman, have used the name “Old-Fashioned Hobnail,” often without clearly indicating that this is not the official name of the pattern. A critical point in the history of the pattern’s name occurred in 1979 when Sinclaire and Spillman published extracts from a “catalog” (actually, a folio of photographs) then in the possession of Mrs. Penrose Hawkes. By 1997 this collection had passed to “the Museum library” according to the second edition of Sinclaire and Spillman’s book (1997, p. 61). This collection is apparently the one that was published, in a more complete form, by the American Cut Glass Association in 2003, referred to above, which is the second of two such photographic fiolios published by the ACGA, confusingly with identical titles: “Grand Prize Paris Exposition 1889,” hence the use of square brackets in this GUIDE. Fortunately, this most recent representation provides the original, numbered plates, with little or no reduction in size. In the Sinclaire and Spillman book (both editions) the photographic plates are reduced in size and are severely cropped, with the result that plate numbers are eliminated, and the labels on individual items are often illegible. Even more important, for our purpose, is the fact that Spillman — who wrote the Hawkes chapter in the Sinclaire (Farrar) and Spillman book — apparently was limited to publishing only one illustration of cologne bottles. She selected plate no. 917. Had she chosen plate no. 915, the identity of patent no. 18,267 would have been revealed because this plate contains a globe cologne cut in Grecian & Hobnail, a pattern that matches the patent’s design exactly. A comparison of the pattern lists and illustrations in the two editions of the Sinclaire (Farrar) and Spillman book with lists and illustrations in the 2003 PHOTOGRAPHIC FOLIO has convinced the writer that plate no. 915 was most likely available in 1979. Whether the pattern on the cologne was not recognized, or whether it was simply overlooked, we will probably never know. We only know that it has taken an additional 25 years for us to identify positively the Grecian & Hobnail pattern as patent no. 18,267. Happily, we can now throw away that “Old-Fashioned Hobnail” mask! Dorothy Daniel would undoubtedly be pleased. Celery tray cut in Hawkes’s patented Grecian & Hobnail pattern of 1888 (patent no. 18,267) cut on shape no. 598. Formerly known as “Old Fashioned Hobnail”. L = 11.5″ (29.2 cm). Sold at an eBay auction for $270 in 2000 (Image: Internet). One now naturally seeks, with increased optimism, the Grecian & Hobnail pattern’s “sister” pattern, patent no. 18,268, which was patented on the same day as Grecian & Hobnail. Revi gave the name “Star Rosette” to this pattern, using terms that appear in the patent’s specification (Revi 1965, p. 180). The two patents also, of course, have an “older sister” — Hawkes’ Grecian pattern — which was patented a year earlier as no. 17,837. All three of these patterns were sent to the 1889 Universal Exposition (Paris) if the hypothesis that is proposed in the Hawkes file for the “Star Rosette” pattern is correct. 1. [HAWKES PHOTOGRAPHIC FOLIO II (c1897)] catalog. ACGA, 2003, lii + 247 pp. Earlier, the ACGA published the following catalog: [HAWKES PHOTOGRAPHIC FOLIO I (c1902)]. ACGA, 1999, vii + 220 pp. Because official, catalog names for many patented patterns were not available at the time of his research, A. C. Revi, a pioneer in the investigation of American brilliant-period glassware, frequently assigned names to patterns based on wording found in their patents, a technique first used by Dorothy Daniel (1950). The relevant phrase in Hawkes’s patent no. 18,268 is the following: “In the center of this star is formed a rosette . . .”, hence the name “Star Rosette” (Revi 1965, p. 180) where “star” refers to the seven-pointed extended hobstar that includes the entire pattern, and “rosette” refers to the much smaller, centrally placed (basal) multi-pointed hobstar in this design. These features are the same as those found in two other patented patterns: the earlier Grecian pattern, patented in 1887 and the Grecian & Hobnail pattern which, like “Star Rosette,” was also patented in 1888 (note 1). New patterns had to be designed for the Exposition, of course, including ones that could be patented. Hawkes probably decided that the first design patent owned by his company, 1882’s row-type pattern, known today as the “MacDonald” pattern, was too old-fashioned for the fair because records indicate that it was not among the patterns that were sent to Paris. In any case, its patent (no. 17,838) was due to expire soon after the fair was scheduled to open. Nevertheless, by the summer of 1888 Hawkes had several patterns in hand whose patents would still be in effect during 1889. They included Grecian (pat. no. 17,837), Russian & Notched Pillars (pat. no. 17,838), Grecian & Hobnail (pat. no. 18,267). “Star Rosette” (pat. no. 18,268), and Princess (pat. no. 18,301). The Brazilian pattern (pat. no. 19,114) would be added to this list the following year. The Russian & Notched Pillars pattern as seen at the fair, was a slight variation of the patented pattern whose name has, somewhat confusingly, been given as Russian & Pillar by several investigators, starting with Daniel in 1950 (p. 205). Russian & Pillars (always plural), however, is an entirely different pattern. Several items cut in it were included in the shipments to Paris. Only one item, however, was prepared in the Russian & Notched Pillars pattern — a magnificent 18″D two-part punch bowl whose blank was made by C. Dorflinger & Sons. The punch bowl is shown in Spillman (1996, p. 234) and can be seen today at the Minnesota Historical Society. For comparison purposes the reader can find an example of the Russian & Pillars in Spillman (1996, p. 177) while the best illustration of the patented Russian & Notched Pillars pattern, outside the USPTO Web site, is probably the pen-and-ink drawing by Sigismund Vidbergs that Daniel includes in her book (1950, p. 202). Vibergs used a copy of the photograph of the pattern that was included in Hawkes’s patent application. Formerly this illustration was not available at the USPTO Web site, but it since been restored and can now be seen there. Its quality is surpringly good. There is no doubt that Hawkes was hard-pressed to obtain as many patents as possible for the glass he planned to exhibit in Paris. He was obviously concerned that some observers, including Americans, might copy his patterns. Although he had obtained patents for Grecian and Russian & Notched Pillars as early as 1887, before he had decided to compete in the Exposition, patents for Grecian & Hobnail and “Star Rosette” were not filed until 9 Jan 1888. These new patterns were probably designed by Hawkes about the time he made up his mind to enter his glass in the expo. Spillman (1996, p. 222 et seq.) suggests that this was “early in 1888,” although it could have been a few weeks earlier. It is interesting to note that Hawkes initially tried to have the earlier patent, the one for his Grecian pattern, extended to include both of these new patterns because of their similarity to Grecian (and to save a bit of money!). His patent attorneys, Knight Bros., however, rejected this idea and insisted that separate patents be sought in order to protect the Grecian & Hobnail and “Star Rosette” patterns (note 2). To increase his pool of patented patterns, Hawkes decided to patent a pattern, Princess, that he had been cutting since at least January 1887 (Spillman 1996, p. 185). He filed an application for its patent on 11 Mar 1888, and the patent was granted on 8 May 1888. There remains to be discussd only one additional patented pattern that was sent to Paris, the Brazilian pattern. Its story is a complicated one, however, and, therefore, it is discussed in a separate file: brazilian.htm in Part 4. 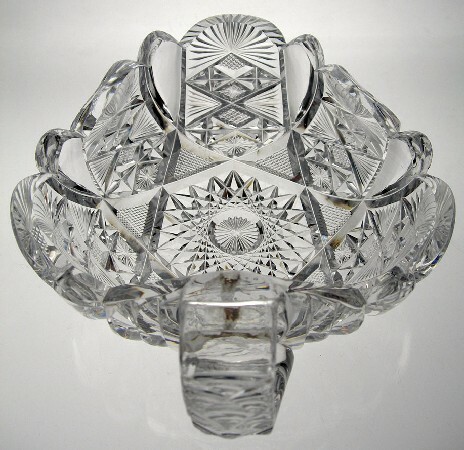 Here it is sufficient to mention that the pattern was initially called “Venetian” (and was listed on the shipping manifest as such), but the name was changed to Brazilian prior to a 15″D two-part punch bowl in this pattern being exhibited in Paris. This was the only piece in the Brazilian pattern that was sent to the fair, probably because Hawkes lacked the time to cut additional items. As it was, Hawkes was so pressed for time that he was not able to file an application for a patent for the Brazilian pattern until 29 Apr 1889. Consequently, the patent was not granted until 28 May 1889, well after the fair had opened. The Venetian/Brazilian name-change came about because L. Straus & Sons had named its patented pattern of 1888, Venetian, and had advertised it widely. Hawkes must have felt that it was in his own interest to avoid a duplication of names that could confuse the public. However, by the following year (1890) he apparently had second thoughts because he again chose the name Venetian for another new patented design. This time the name stuck, but the Exposition was long over! This new pattern is the Hawkes Venetian pattern we know today (pat. no. 19,865) (note 3). In summary, Hawkes sent the following patented patterns to the Universal Exposition: Grecian, Russian & Notched Pillars, Grecian & Hobnail, “Star Rosette”, Princess, and Brazilian (sailing under the name “Venetian”!). All Page Numbers Are Found in Spillman (1996). 1. Make a list of the patterns that Hawkes sent to Paris, as found in Spillman’s book, pp. 226-9, and p. 232. (Pillars & Silver Diamonds and Silver Diamond & Pillar are assumed to be the same pattern.) You should have a list of 29 patterns. 2. Eliminate the names of patterns patented by Hawkes before 1889 (e.g., Princess, etc. ), together with all other pattern-names on your list that are illustrated in the standard texts and ACGA catalog reprints and are, therefore, identifiable (e.g., Russian, etc.). 3. In lieu of concise patttern names, Hawkes sometimes named patterns by simply listing their major motifs. He had, after all, to come up with several new names at this time. Note the motifs present in the “Star Rosette” pattern, as illustrated below, and compare them to those indicated by the pattern names that remain on your list. Eliminate those patterns that contain motifs that are not present in the “Star Rosette” pattern. (Remember: stars = hobstars; silver diamonds = strawberry (or fine) diamonds; and lace hobnail = cane) (note 4). 4. You should now be left with only two pattern names on your list: Japanese and Empress, neither of which is illustrated in any extant Hawkes folio or catalog that the writer is aware of. You can, however, determine which is the correct pattern name for “Star Rosette” by using the shape (blank) numbers that accompany the individual items on the shipping invoices. Look them up in the Hawkes Number Book (pp. 102-137). Tray no. 217, the only shape that was used for the Japanese pattern, yields no useful additional information and can be eliminated, however reluctantly. Bowls 462 and 463, on the other hand, provide pattern information as well as shape information. Mitered outlines that were designed by Hawkes for three patterns, and three patterns only (as far as we know), are clearly shown. They were used for the patterns Grecian, Grecian & Hobnail and “Star Rosette”. 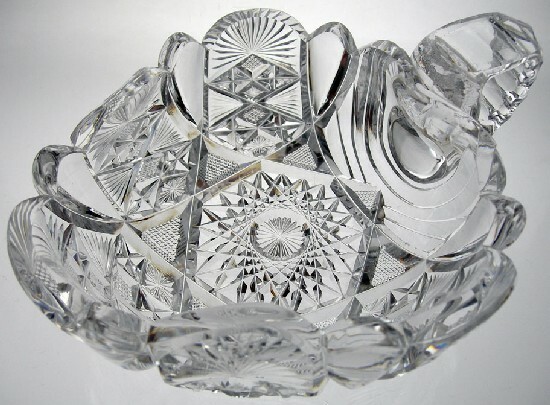 Because the first two patterns were eliminated in step 2, only “Star Rosette” remains and we reach the conclusion that the official name of “Star Rosette” is the “new” name of the pattern that was cut on bowls 462 and 463 — Empress. SHORT CUT: Instead of playing this game of elimination you could have used Spillman’s list of shapes (blanks) and discovered the importance of bowls 462 and 463 more quickly. But in the process you would have missed out on getting to know the patterns that were sent to Paris, as well as those that were not — including Venetian, “Maltese Cross,” and Chrysanthemum. Although these three patterns were not patented until the year after the Exposition, claims have been made that the first and last of them made the trip, claims that we now know are not true. Unless, of course, these patterns were known by other names in 1889 which is a possibility. The banners in the Grecian pattern are cut in Russian. In Grecian & Hobnail they are cut in hobnail, the obvious reason for the pattern’s name. In “Star & Rosette” there are too many motifs in the banners to permit a concise pattern-name based on motifs. 2. Letter from Knight Bros. to Spencer & Mills (accountants for T. G. Hawkes), 30 Dec 1887 (R-659, Rakow Research Library). 3. Venetian was probably given its name during 1890. It is not used in the patent’s specification. Hawkes did not begin to use a pattern’s name in his specifications until he applied for a patent for his Chrysanthemum pattern (pat. no. 20,257) in the fall of 1890. He continued this practice — so convenient for today’s collectors — for several years, ending it in 1897 with his Festoon pattern (pat. no. 26,731). 4. If Grecian & Hobnail were not eliminated in step 2 — perhaps because the reader did not realize that this is now the official name of the former “Old-Fashioned Hobnail” pattern — it would be eliminated at this stage because the name would obviously not be appropriate for the pattern in question: “Star Rosette” has no hobnails.